Occupied entirely by a group of death-row prisoners, most of the film is set on a gravity-filled space ship in the midst of its vague years-long voyage. In exchange for their lives, the prisoners have volunteered for some sort of unclear but clearly hopeless intergalactic experiment dealing with human sexuality. As the only real plot-driven character, Juliette Binoche portrays a twisted mad scientist doctor, convicted of killing her family, who experiments on the space ship's inhabitants using a few strangely sexual techniques to experiment with pregnancy in space. 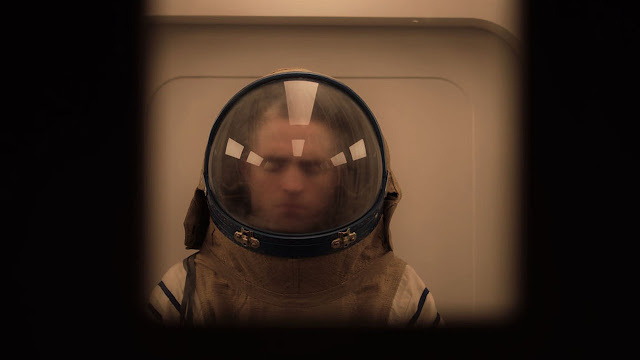 Like many psychological space operas, High Life's contained environment is a heightened metaphor for life in general, human behaviour, and the social contracts we accept living in society. Little character details about each passenger's past, their violent crimes, and sexual desires reflect on the humanity of the film's very layered themes. Denis offers a sprawling cast yet many of the idiosyncratic characters, outside of the ones played acerbically by musician André Benjamin or scream queen Mia Goth and other familiar faces, never get much fleshing out. We see many of the crew of prisoners as memories or non-linear flashbacks remembered in passing through the short lives on the contained vessel. Even the depiction of space within the film is moodily eerie. Space locks open like normal doors and objects fall outside despite the lack of gravity. It's a cerebral purposefulness that makes the budget sci-fi story so psychological and isolating in its execution. High Life's mysteriously elusive story is difficult material. However, Denis' artful, surreal mediation and patient filmmaking anchor the film in a strangely seductive humanity despite some confusion and the foggiest of narratives. The carnal nature of the violence is another challenging aspect that's endlessly debatable. High Life opens in Vancouver on April 19th.